Nothing makes tropical get-away more perfect than investing a touch of energy into fishing at Smith Mountain Lake, and when you’re at the sea, the most ideal approach to get on fishing is by booking fishing charters. They are an awesome method to spend a couple of hours, or a day or two, on the water without worrying about things like mooring your boat yourself, finding suitable fish, and also, fuel costs. There is unquestionably no lack of alternatives with regards to picking the correct fishing charter in SML. Simply stroll down to the neighborhood dock, chances are you’ll find twelve captains in no time. Captain Erik of Rockfish Adventures proudly offers a 100% fish on guarantee. This makes him the most sought for fishing charter. Striper and Catfish Fishing in Smith Mountain Lake is a year-round experience and Captain Erik makes it a successful one. A tour with him lasts for around two hours and six people are permitted to sit in a boat at once. What’s more? If, while taking the tour, you feel like there is a certain point of interest that you would like to see closely, ask Captain Erik to show it to you and your wish would be granted. Visit the website to book your tours and go angling now! Herbert Hoover said, “Fishing is much more than fish. It is the great occasion when we may return to the fine simplicity of our forefathers.” Are these your thoughts as well? Is fishing more than a recreational activity for you? Whether new to the world of fishing or an experienced fishing enthusiast, you would know that it is not that easy in the first place. Especially, when it is about striped bass fishing, one has to invest extra efforts and may even need the advice of an experienced striper fishing guide. So, if you too have been considering to go on a striper fishing tour with your friends, make it a point to avail the guidance of one of the striper fishing guides to make your experience worthwhile. There’s no doubt that striped bass fishing in Virginia is a remarkable experience. However, the fact that the advice of a striper fishing guide works well in successfully locating and reeling in the beautiful fishes cannot be denied. If, in the past, you haven’t tasted success in your fishing adventures, rest assured this time, going with one of the best striper fishing guides would be of immense benefit. That said, don’t waste any more time. Go ahead and initiate contact with Captain Erik of Rockfish Adventures without further ado. 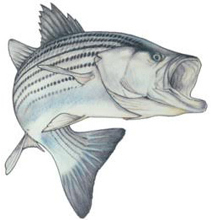 Well-known for offering guided striper fishing trips at Smith Mountain Lake for fishing enthusiasts, Captain Erik is one of the most reliable striper fishing guides in Virginia. So, if you too want your day to be a success, get in touch with Erick right away!